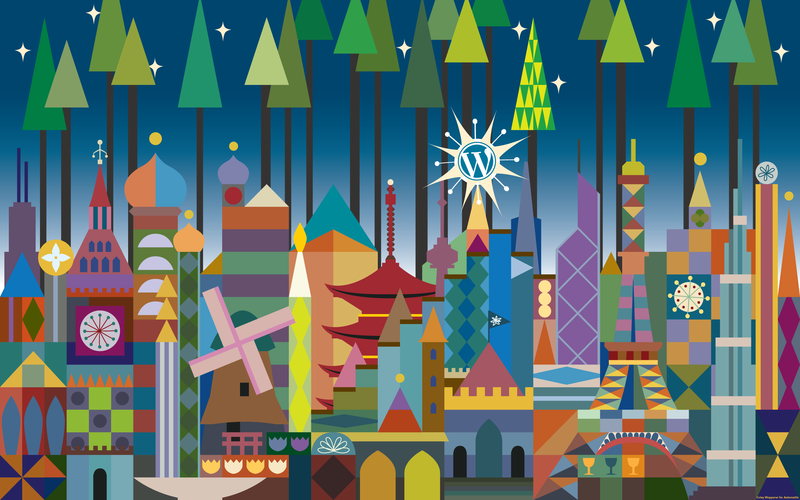 This year, we teamed up with San Francisco artist Coley Wopperer to spread some WordPress-themed holiday cheer. We thought it turned out so well, we wanted to share it with everyone as a collection of desktop wallpapers. Sure to bring a smile to your face, even if you’re staring at spreadsheets all day. 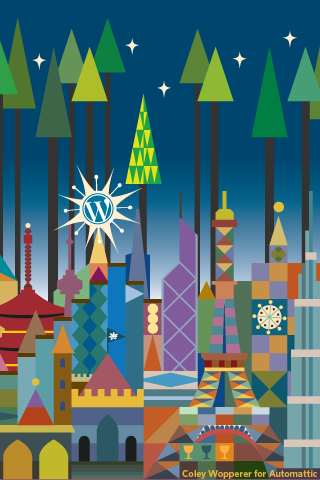 Happy holidays from all of us at Automattic! Beautiful artwork! Thanks Coley and WP! this looks cool. I just uploaded it to my phone. Wish I could get the snow with it. LOL. Yeah, I know i ask for too much. Wow, thanks! It looks cool – although a bit too busy I guess? Awesome. Happy holidays! Thank you. MERRY CHRISTMAS N HAPPPPPPYYYYYYYYYYYYY HOLIDAYSSSSS………. It’s wonderful!! Love all the colors and shapes! I just wish this was a theme–even just temporarily! I’d change up my background–or use it for the holiday blog I’m getting ready to work on…maybe next year? Merry Christmas everyone! May your year be prosperous and joyful! God Bless You! Thanks a lot for sharing, Coley & MNT, this wallpaper is realy beautiful (& so cute on a blog too! 😉 Have a fantastic Christmas everyone at Automattic! & WordPress! Any chance that there are new themes in the works for the new year? A very good vertical project, developped in an international way. My compliments and season geetings to all the world. A bit too theme park looking for my liking I am afraid. How wonderful and thanks for sharing. Happy New Year! Great idea! Let’s all share in the spirit of peace and hope this holiday season, and carry our mutual desires for health and happiness for all into the new year. WOW, this is gorgeous, i like it and may i take this opportunity to wish everyone a merry christmas and a happy year.I know we all coming from a very stressing year in terms of the down turn economy and we should all pray that 2010 shoud be the improved year eonomically globally. Very colorful and love the snow falling through the air and buildings. Y’all have a Merry Christmas and a Most Prosperous New Year. 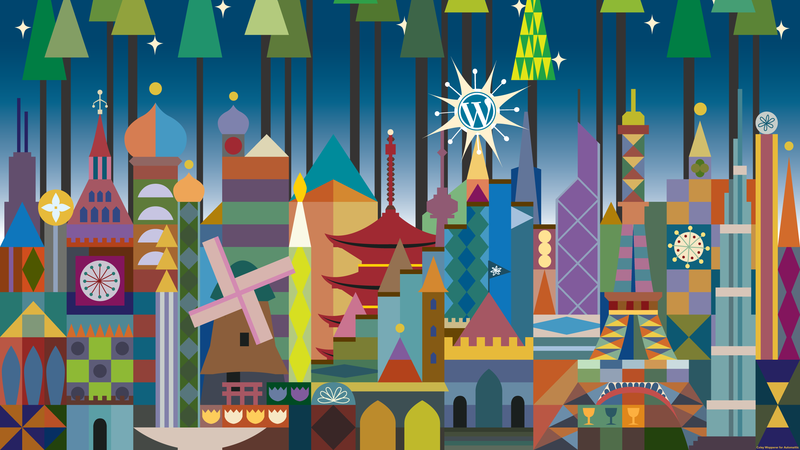 wew that’s so great, anyway..could you explain me why you did draw buildings for wordpress theme in holiday cheer? That’s beautiful, but my mini laptop’s resolution is 1024×600. Are there WP’s wallpapers for netbook? The 1024×768 version should scale down just fine (in your desktop background preferences, choose to center the image instead of stretching or “fitting” it). It’s my wallpaper on my laptop now. A little bit too busy if you have a lot of files on your desktop as I use to have. Merry Christmas. And for all fleas a Happy New Year! I don’t care for it much, doesn’t have a Christmas look or feel to it. I was just writing about Christmas on Acid, and here’s the wallpaper for it! It’s beautiful! I will enjoy this through the holiday! The wallpaper is very beautiful just as decorative and creative as the Christmas Tree. Happy Holidays time for sharing with family and friends. thank you and merry christmas to everyone works at WP! wonderful design. Thanks, it’s on my laptop as we speak! So cool that you’ve used an artist and that you choose to share it with us at this time of giving. Great image. It properly illustrates the fact that bloggers are a colourful international community using WordPress – the star…as it should be. I love it! What a wonderful departure from the usual red, green, white, blue images you see around this time! Reminds me of Disney’s classic “It’s A Small World” at Disneyland. I this desktop wallpaper until that song started repeating itself in my head. AAAAURGH! Seriously, it’s a pretty sweet desktop! Nice work! Very cool, thanks and happy holidays! Interesting wall paper! Wishing everyone in the cybersphere all the best of this festive season — whatever and however you celebrate! 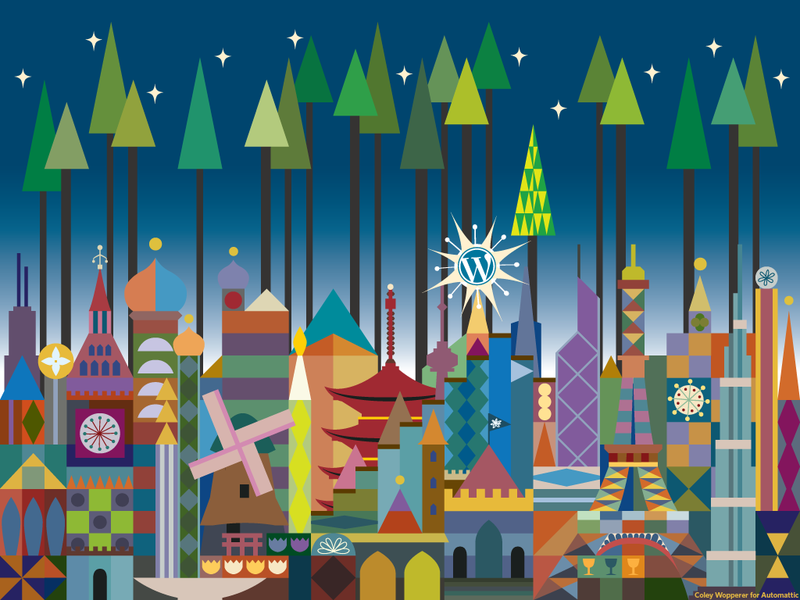 Design looks similar to Disney’s Small world. Like this a lot… looks great on my HTC Hero’s lock screen. Very cool. I might actually use this. Quite true there Lisa, perhaps Santa with a Holden and ‘Roos . .? Or a sunset over Ayers Rock, or sunrise over the Great Barrier Reef . . .
Or the Harbour on Boxing Day when the fleet sets sail on the Sydney to Hobart . . ? There are ppl on this side of the globe, remember!? Sorry, it’s not my kind of style. Like this somewhat. Thanks guys. Merry Christmas & Advanced happy new year to everyone!. The wall-paper is great ! Wish everyone a merry Christmas and a happy new year ! Welldone! It really looks like the self generated avatar. We can see many differents culture on this nice town as well many colors ! Nice symbole. Congrats to the artist ! Thanks! I´m using it on my PC. I wish I had seen this sooner. I like it. I liked the colors, they are cool! thats pretty cool…..its different, but i like it! do you guys have anything for new years? Besides being beautiful aesthetically speaking, artwise, etc… (and they mos def ARE!!!) I love the fact they they look perfect on my Mac. My Mac is old and outdated, yet these display perfectly on my desktop. I got two others and all three rotate every 5 mins. Thank you. Well done! WICKED that is sooo my decktop back ground already! love it!